The Church Office will be closed Easter Monday. Pastoral Care Meeting: Tuesday, April 23rd at 12 noon in the Witcher Room. Coffee Shop Bible Study: Every Monday morning at 11 am we meet at The Vault Coffee and Espresso Bar (101 St. Andrew Street W, Fergus) for an hour of snacks and study focused on the upcoming week’s lectionary readings. Everyone is welcome! Morning Prayer: Every Wednesday at 10 am. All are welcome. Women's Community Lunch: Every Wednesday at 12 noon in our Butterfly Hall. Free and Fun! 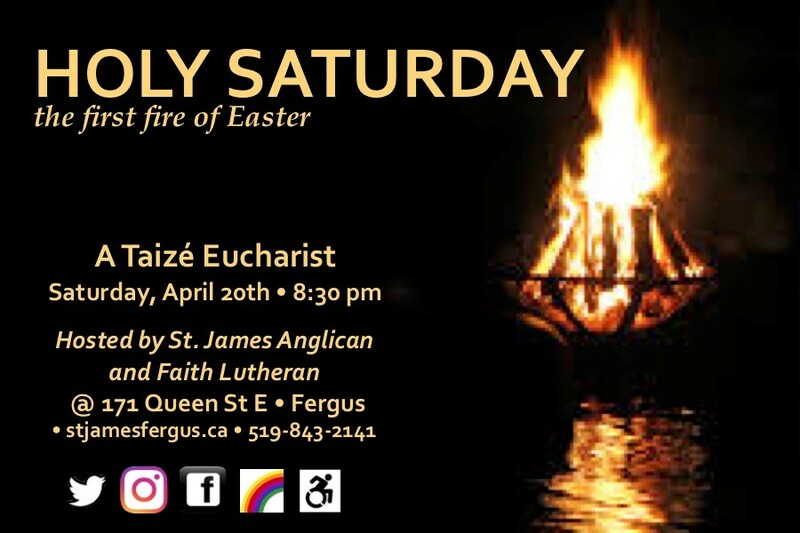 Our next Taizé Service is on Wednesday, April 24th at 7pm. The theme this month is "Gratitude". Take time out and join us for an ecumenical service of song, prayer and meditation held in the beauty of candlelight. This service is held on the 4th Wednesday of each month at 7 pm (except July/August). All are welcome. Our church is fully accessible. ACW....We need your help. The ACW is once again running the Food Booth at the Miniature Show at the Centre Wellington Sportsplex on May 5th and, we need your baking. This is a great fund raiser for our Church. We have a bake table and also sell deserts from the booth. Best sellers are cookies, squares, tarts, pies, loaves, etc. Please bring your baked goods by 9:30 am to the kitchen at the Sportsplex or call Diane Irving 519-843-4231. ACW Rummage Sale: Saturday, May 11th, 8am to 12noon. Donations can be left in the store room. No large items or furniture, thank you. Lost and Found basket in the narthex. Items not collected will be donated to the basement sale. Many at St. James have proven to have a heart to support ministry with youth and children. Canterbury Hills, our diocesan camp in Ancaster, has released an appeal for donations both to capital expenses and to offer bursaries to children attending their summer camp. Many of us have children and grandchildren who have enjoyed this place over the years and it has a great reputation for delivering fun and friendly programmes, both day camp and overnight. They also host numerous youth and development events throughout the year. If you wish to donate to Canterbury Hills, simply mark your gift “Canterbury donation” and submit it with your regular offerings. What a wonderful gift of summer fun to offer! Gift Cards are ordered the first Sunday of the month. Thank you to those who are continuing to use the gift cards and to those who are new supporters. Profit for the first four months of 2019 is $612.97. Again, in April our order was under $5,000.00 and, as such, we needed to pay $10.00 shipping. With a few more parishioners ordering, we can avoid this charge. If anyone wants more information about this fundraiser, please see Linda Webster. The next order date is Sunday, May 5th. Bishop’s Company Dinner: The annual dinner will take place at the Michelangelo's Event and Conference Centre, Hamilton on Monday, May 27 beginning at 6 pm. 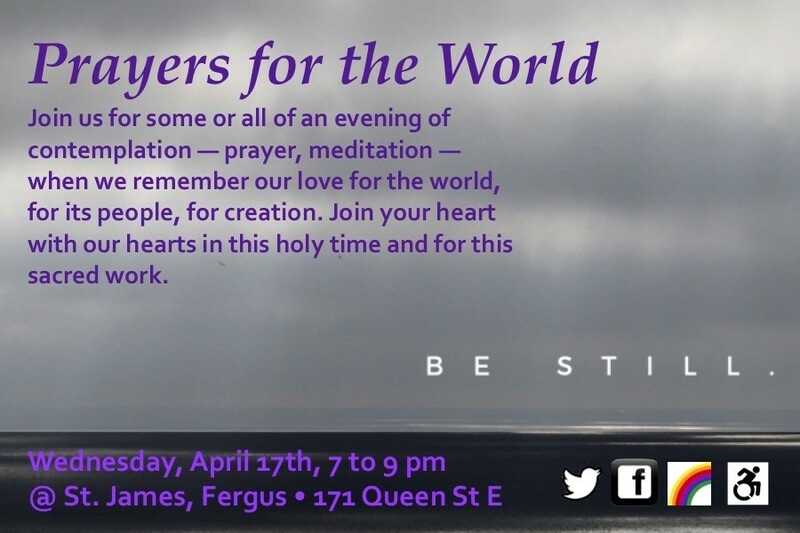 Guest speaker will be Archbishop Fred Hiltz, primate of the Anglican Church of Canada. 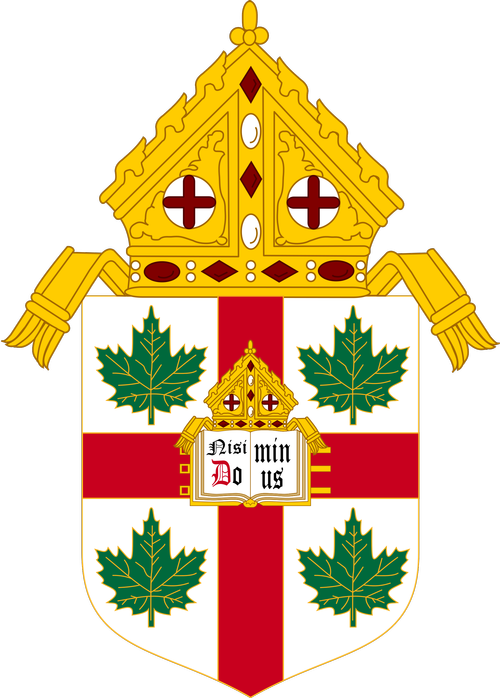 Archbishop Fred is a friend of many in our diocese, having spent a great deal of time here throughout his primacy. His gentle and faithful witness, both within and beyond our beloved Church, reflects servant leadership at its best. The cost for dinner guests is $75 per person. Please speak to Rev’d Ann or Angela if you wish to attend. For more information click here. Centre Wellington Food Bank needs crackers. Please leave donations in the baskets in the narthex. Thank you for your continued support. Simply click on the passage and you will link to the scripture reading. Weekly meeting in the Witcher Room. Quilters meet in our Butterfly Hall each Tuesday. Anyone is welcome to join for a time of fellowship and to learn the art of hand quilting. 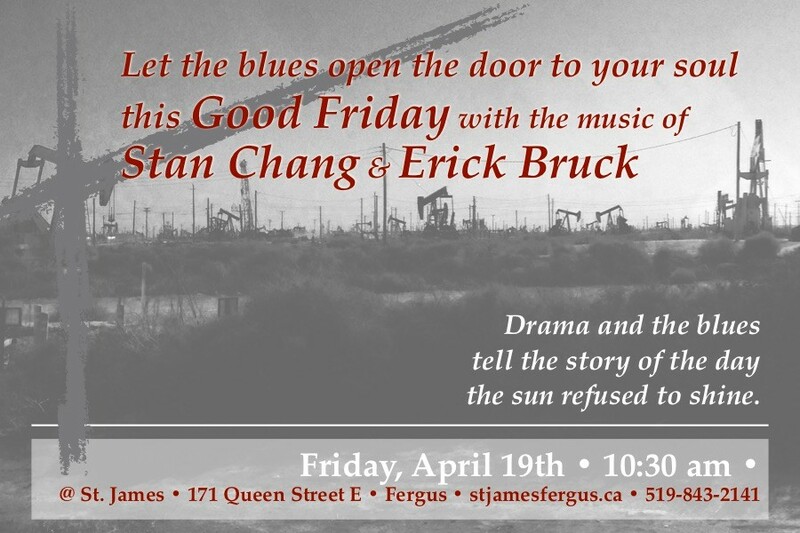 Take time out and join us for an ecumenical service of song, prayer and meditation held in the beauty of candlelight. This month our theme is 'Gardens'. No experience required. All dances taught and then prompted by callers. Live music. Individuals welcome. Beginner & new contra dancer orientation at 7:45pm. Adults: $12, Students: $8, Youth: free. Every Monday at 11 am. We meet at The Vault Coffee and Espresso Bar (101 St. Andrew Street W, Fergus) for an hour of snacks and study focused on the upcoming week’s lectionary readings. Everyone is welcome! Sparks meet each week in our Butterfly Hall. Click here for further information. 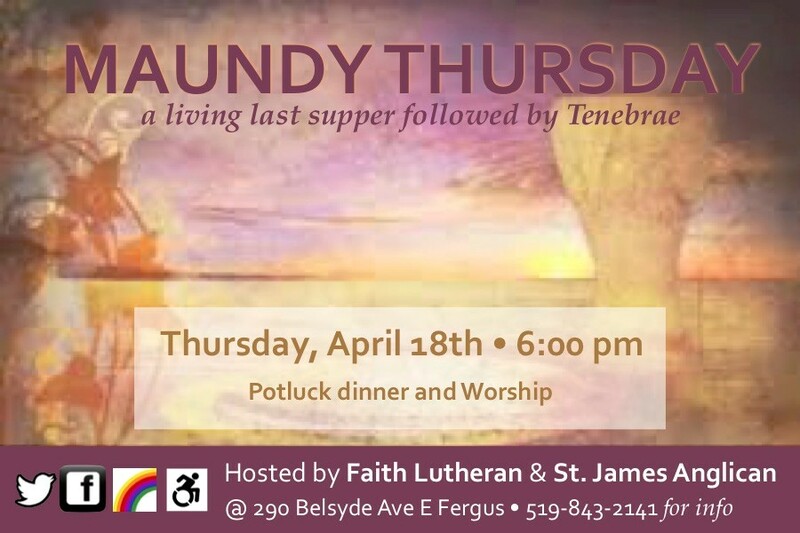 The Prayer Shawl Ministry at St James is an outreach ministry within our parish and the community. The group meets on the first Thursday of each month in the Witcher Room. All are welcome. Take time out and join us for an ecumenical service of song, prayer and meditation held in the beauty of candlelight. This month our theme is 'Free to Grow'. Check back here soon for further information. Take time out and join us for an ecumenical service of song, prayer and meditation held in the beauty of candlelight. This month our theme is 'Creativity'. Take time out and join us for an ecumenical service of song, prayer and meditation held in the beauty of candlelight. This month our theme is 'Connections'. Take time out and join us for an ecumenical service of song, prayer and meditation held in the beauty of candlelight. This month our theme is 'Francis & Clare'. Take time out and join us for an ecumenical service of song, prayer and meditation held in the beauty of candlelight. This month our theme is 'Living The Way'. Join us to greet the new year at a Taizé service of ecumenical service of song, prayer and meditation held in the beauty of candlelight. This month our theme is 'Turning of the Year'.